The test virtually eliminates the baby’s risk of inheriting serious genetic diseases from the donor and father. 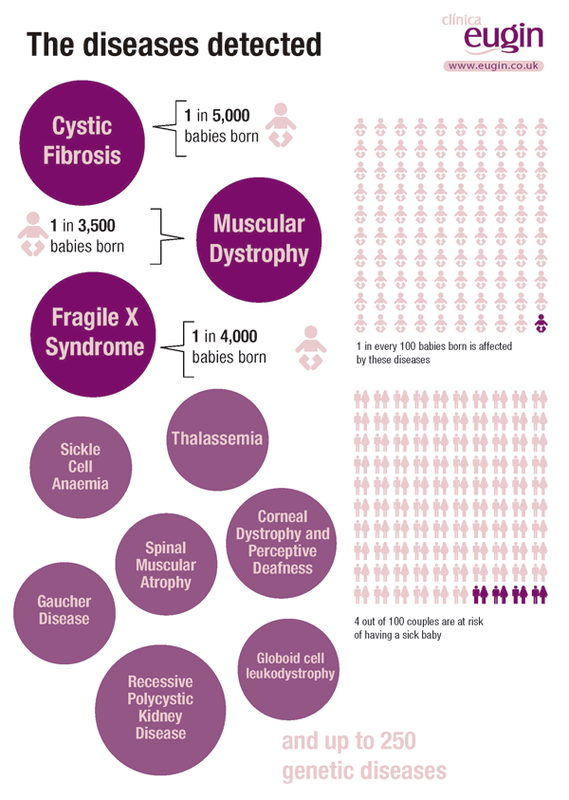 Cystic Fibrosis, Muscular Dystrophy, Fragile X Syndrome and so on including up to 250 serious genetic diseases will virtually disappear in babies born of assisted reproduction treatments. Eugin Clinic, which accounts for 10% of donor egg treatments performed in Europe, is implementing an in-depth detection test of these pathologies on all their donors. The test, which is carried out by means of a blood sample, enables us to detect all egg donors who are carriers of a genetic disease of the 250 identified. Currently, most people carry a genetic disease without knowing it: even though they are carriers, they will not develop the disease. In fact, 4 out of 100 couples are at risk of passing on these diseases to their children. “The hereditary genetic diseases we are referring to have a serious prognosis and in many cases the child does not succeed in overcoming them” says Dr. Rita Vassena, Scientific Director at Eugin Clinic. “Our goal is for healthy children to be born through assisted reproduction” she explains, “and today science allows us to put a stop to many of these diseases”, she says. In the United Kingdom, 1 in 100 babies are affected by a hereditary genetic disease, according to Dr. Vassena, “these conditions have a significant impact on the baby’s life expectancy and quality of life, and are a drama for the family”.